Proving what is good for Wallstreet is not in the best interest of business. What’s good for Wall Street is generally not in the best interest of anyone other than Wall Street. Stock buybacks and ‘financial engineering’ are, of course, a result of the Fed’s policy of free money. This new norm is insane! Capital must have cost, and if it doesn’t, the Free Market becomes a rigged market. Financial engineering has been going on a lot longer then ZIRP. The introduction of junk bonds followed by derivatives is the origin. It was also aided by the fall in price of computing power. The ability to model minute by minute with no regulation gave rise to the activity. Now the financial markets are all a bunch of computers competing with each other, and management liking it, because it gives them cover. Petunia, I was reading not too long ago about the likes of Jay Gould, and others from the era of the railroad robber barons. Selling bonds to get money to pay dividends was one of the old tricks, to juice the stock prices. Sound familiar? Of course! So the ‘bondzi’ scheme is really quite old. Reading about what went on in the late 1800’s, and how well oiled it was then, well, there is nothing new under the sun. The activism back then matches the current operators. Thankfully there are people like Wolf, doing a great job of showing what’s really going on. A number one site to get real insight. The CEOs and boards that have allowed companies to pile on debt to compensate them, thru stock buybacks, should all be arrested. It is simple theft. The boards have the responsibility of safeguarding the assets of the companies and they haven’t been doing their jobs. Everybody in the C-suite has been living large from the productivity of the employees who really produce. We have the wrong people in jails. Everything you have said here is right on. Change in the opposite direction is far too slow. I don’t know what makes you so bitter but your comment is totally off. You are accusing wrong people, they only ask for money, somebody else is giving money. Understand. OK, if you go to the bank and ask for 1 million and bank manager approves that even though you are never or maybe pay it back; Who is at fault and who should be in jail? If these buybacks did not happen, what do you think what would be state of stock market and ultimately entire economic outlook? 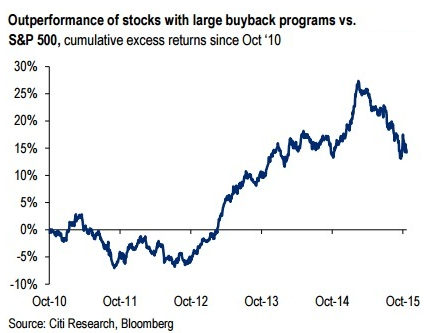 Buybacks are one way to show investors that earnings per share didn’t deteriorate and keep faith in investing and supporting companies who employ huge number of people, who again buy spending money support others. Velocity of money. I think there was post on this blog, go back and check. IBM is in the computer business, not the velocity of money business. A company using finance to support its operations is acceptable. A company replacing its operations with financial gimmicks is defrauding its investors. Even if they are really good at using gimmicks, it is EXCEPTIONALLY misleading, and therefore, fraudulent. Message approved. Most people invest on IBM based on the understanding that it’s a computer company, not a hedge fund. And especially a hedge fund that will surely blow up one day. Well most people invest in stock market thinking that it is what name says stock MARKET, how about stock CASINO. So if you don’t understand this, stay away or loan your money to money sharks (investment advisors) and sleep dreaming that they will take care of your future and retirement. Those times are gone. Remember: “Never invest more than you can afford to lose”. This proverb stood test of time over and over again. And when this collapses too (remember2008) the CEOs will say “well everyone was doing it”. Remember the quote “when the music plays we all have to keep dancing.” from the financial crisis. These CEOs should be FIRED. That’s why they get the big bucks- to ruin their companies? But increased share price increases their bonus as well and they still get huge pensions etc. Petunia you are 100% correct. What has happened to America? They are ruining the country I was proud of. Companies that once issued stock to grow, now take on debt to buy back their shares that increase the share price and dividends for the other share holders. Another common sense and values based comment by Petunia. Right on. Dishonest company practices and company officers are what they are. They steal from us all when they debase our economic health. Finance and legal people must find threat and risk in those physical processes and material constraints that exist in manufacturing or production. Much better to have clearly defined (and abstractly defined) deals and assets that lock value into the balance sheet and P&L. John Kenneth Galbraith described a bifurcated industrial system in _The New Industrial State_, divided between the market sector where companies’ results were determined by day-to-day business conditions, and the planning sector where big companies with immense capitalization planned and executed giant projects in their core businesses (e.g. the many-year process of bringing a new vehicle, a mini-van, say, to market.) I think you can see the modern FIRE sector emerging from these giants as they ditched all the lines that got in the way, and made their planning difficult. Just 6 stocks are keeping the S&P 500 off the floor and account for over 9% of the equity cap of the index, with a valuation over 20X EBITDA ! All of them are overvalued by 100% compared to the rest of the market! Financial engineering has become part of US DNA. Note that neither Germany or Japan had Business schools or MBA’s. These days with competition for foreign students intense, every one has to offer everything, but here is no demand for the MBA from business. They prefer someone who knows not business in general, but someone who knows THEIR business. In both countries the CEO of an auto maker is more likely to have an engineering background than B- school or, heaven help us, law. The new guy at VW, who has some work to do, trained as a tool maker! Wonder how many Harvard guys he met there? If only the stuff about to hit the fan was nice soft poop. Wolfstreet.com is the only site where we learn as much from the commenters as from the articles, especially from Petunia.